Homes starting from the upper $200’s! Discover your new place to call home! A sense of arrival is immediate as you arrive at the Winston Ridge neighborhood. You are greeted by tree-lined streets and a beautifully landscaped median. Enjoy an idyllic setting convenient to all that the area has to offer and within just minutes to area shopping, restaurants, activity centers, and more. With easy access to I-85 and I-540, you won’t want to miss out on this limited opportunity. Neighborhood planned amenities include a pool, clubhouse, and large open play space. Winston Ridge Wins Multiple Awards in Parade of Homes! The Parade of Homes is the opportunity for builders and developers to showcase their best custom craftsmanship. Every year, these parade entries are judged by industry experts and the best of each category are awarded medals of distinction from GOLD, SILVER and BRONZE. If you’re thinking of buying a Youngsville new home, 100% financing is now available. 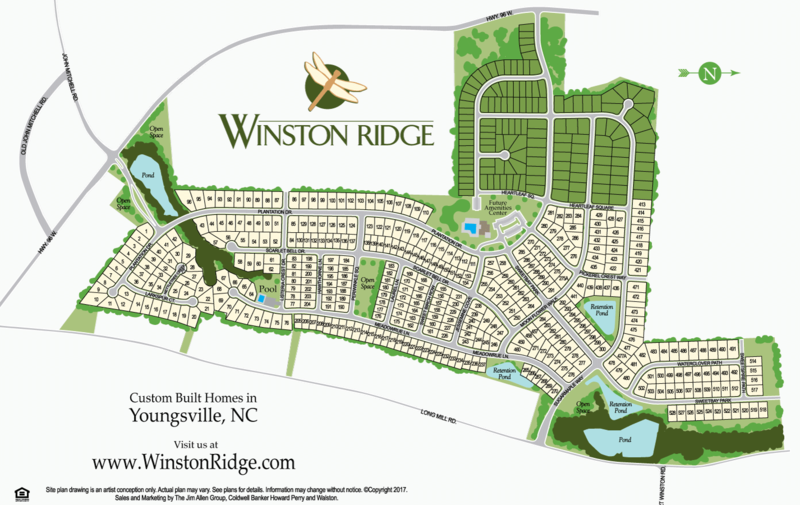 Come see Winston Ridge today! Choose Your New Home Site Today! *Information on schools is not the guaranteed assignment for Winston Ridge residents. Check with Franklin County Public Schools to verify. US1 North through Wake Forest. Left on Hwy 96. Go approximately .5 miles. Neighborhood is on your right.